Photo Courtesy of the University of Texas at AustinMeet your 45th president, America. He’s the same as the 19th, really, only without the beard. 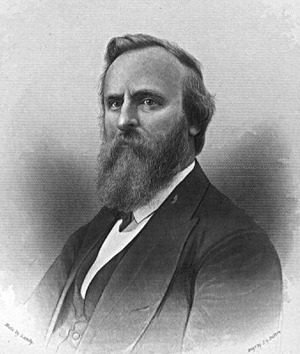 That would be 2012 candidate Rutherford B. Hayes (no relation to the former president), a Gulf War veteran-turned-businessman and as of today, aspiring leader of the free world. He’s also something of a Tea Partier; according to his website, Hayes’s most important order of business in Washington will be to weed out “socialists, communists, and marxists, as well as sensatiable[sic] condescending egos.” Time permitting, he’ll get us out of Afghanistan, institute a 10-percent flat tax, withdraw from the United Nations, return to the gold standard, abolish the IRS, fire all teachers who “indoctrinate children,” and undo the core tenets of his predecessor’s “unconstitutional” health care reform. —Hayes was, after all, swept into office with the help of a systematic vote-suppression scheme and a series of backroom deals; “Rutherfraud” was like the 1870s answer to “Nobama,” except all of the allegations were true. The contestants will be judged in categories of personal interview, swimsuit, evening gown, beauty, talent, questions regarding the documents of America’s founding fathers, and Marksmanship! This will be the first pageant of its kind to introduce competency in the handling, safety and use of firearms, and CPR! The contestants must be able to save a life as well as defend one! In the late 1990s, a Paraguayan TV show fulfilled a 17-year-old girl’s wish after she miraculously emerged from a coma by giving her an all-expense-paid trip to Ohio to see the Hayes Presidential Center.